I don't get game-related gifts for Christmas that often but this year my wife bought me a cool little clone handheld thingy. 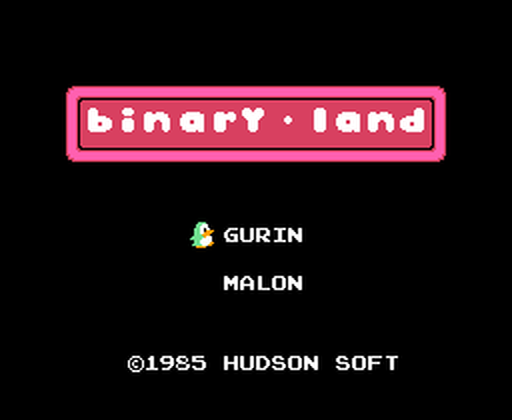 It looks like a PSP but is actually filled with NES games along with an emulator, and the first one I've spent much time with is Binary Land, an early Hudson Soft puzzle/action game which tasks you with reuniting two penguin lovers. 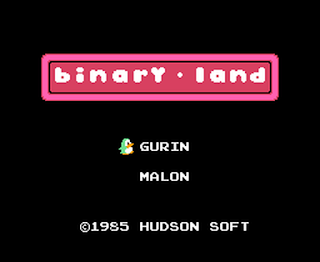 This is done over a series of single-screen stages, each formed from a grid of 15x10 blocks and viewed from overhead, in which both penguins - Gurin (male) and Malon (female) - are dropped in separate locations. Your job is to bring them together at their special meeting point - a heart at the top of each stage which grows cold and diseased in a harsh metal cage until their combined splendour liberates it. 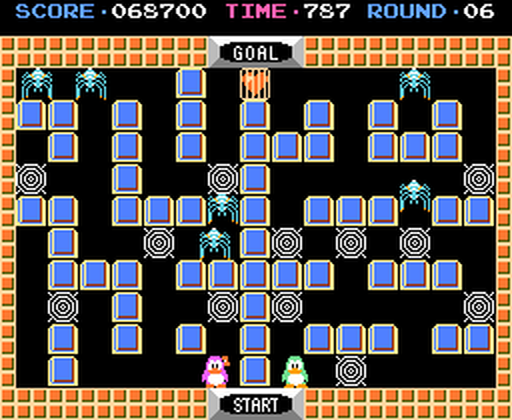 The twist is, in an unusual and initially-confusing move, you control both of the stumbling flappers simultaneously, with the movements of one mirroring those of the other! It's therefore a little odd that you can choose which of the penguins you want to control before starting the game - the only difference is, your chosen penguin will respond to your commands while the other moves the opposite way. If you choose Gurin, for example, pressing right will move him right but also moves Malon left. This makes uniting them a little trickier than it might've otherwise been, specially as the stages are not symmetrical in their layout, and they are also populated by scary beasties too, notably evil spiders which prowl the corridors. These terrifying creatures increase in number as well as speed as you get further into the game and contact with one will cost a life. 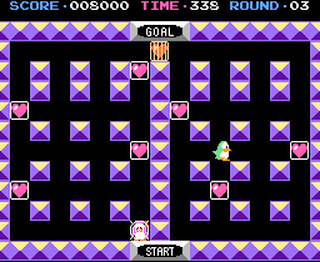 Later on you'll also encounter birds which fly across the screen and will make the penguins switch positions if they touch either of them, and there are also little flame things which look like enemies but, curiously, they seem to be collectable for bonus points. The troublesome arachnids also leave lots of their webs all around the stages and touching one traps the penguin in question. The only way out is for its lover to come to the rescue with his/her special spider-repellent spray. Splendidly, this gets rid of the spiders as well as their webs and both penguins have unlimited use of it. You might think this makes the game pretty easy, and it is a bit easier than it first seems, but keeping an eye on both penguins does get very tricky after a while. It's all too easy to move one while forgetting about the other for a split-second, and then he/she is in the mouth of a spider! In some ways it might even be easier to purposely get one of them stuck in a web, then speed through the stage with the other, taking out the spiders and webs as you go, before freeing the bewildered flapper. This is risky though, because if you then get the free penguin stuck as well, you'll lose a life. This makes even more sense when you consider the stages are timed. You're actually more likely to lose lives to this than the spiders. There are a few pick-ups to make life a little easier though. Most of them just seem to give you bonus points but one of them - bearing the likeness of a whale for some reason - makes both penguins super fast and invulnerable for a brief period. Some wall tiles have secrets hidden behind them too, but it's probably best not to spend too long looking for them. If you can last long enough there are 99 stages to get through, although only 16 of them are unique and are just looped once complete. These should last most players a while by themselves though. Their maze-like designs are progressively more challenging, and getting Gurin and Malon to the exit together can be tricky in itself. I can't tell you how often I've run out of time while faffing around trying to get them the correct distance apart! Eeek, spiders, a bird, and flamey things! 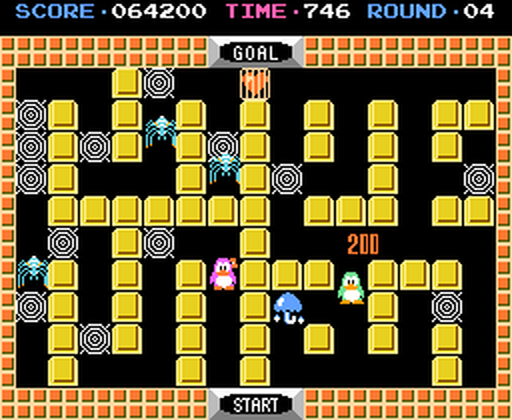 The stages are somewhat basic in appearance (though not nearly as much so as the MSX original) and repetitive too, with only the block colours changing from one stage to the next, but the colours and small sprites are nice enough, and the main tune is pleasant too, helping to make Binary Land an enjoyable game. About the only issue I had with it was the sometimes-sticky control of Gurin and Malon which can be irritating, especially with the last few seconds ticking away! It's not really a major problem though, and worth putting up with to play this appealing and unique little game. I hadn't even heard of it prior to first playing it on my new Christmas gift but it quickly grew on me. 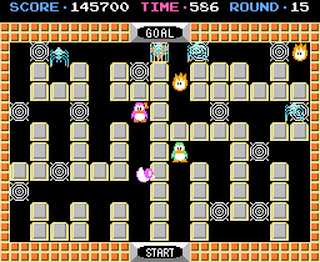 The dual character control thing isn't just a silly novelty to make the game stand out - it adds a lot to what would've otherwise been a bog-standard maze game and forces you to stay alert. A hidden gem? Perhaps so, but definitely worth playing either way. Gameplay Video: here's a video of one loop of the game being played by a talented fellow called nenriki86. Don't watch if you want to avoid spoilers!